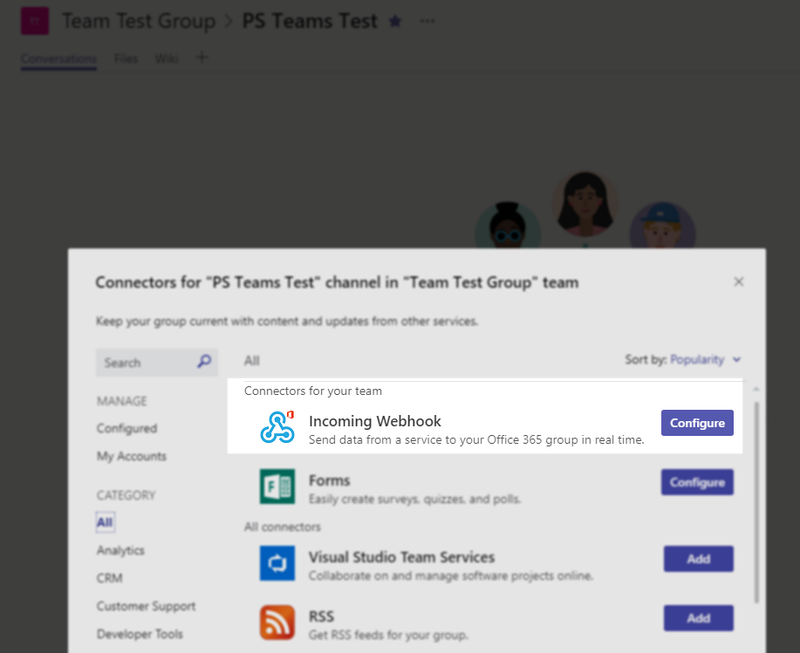 This PowerShell Module allows to send notifications to Microsoft Teams. It's pretty flexible and provides a bunch of options. 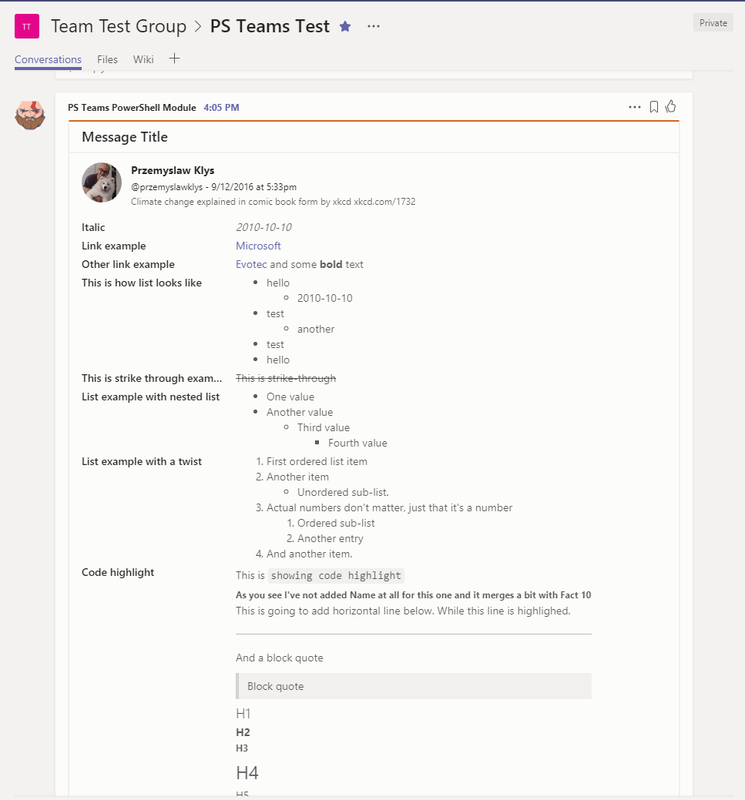 While there are already 2 other modules related to sending notifications to Teams this one takes it a step further. Inspiration for this module came from Matthew Houston and was my starting point. 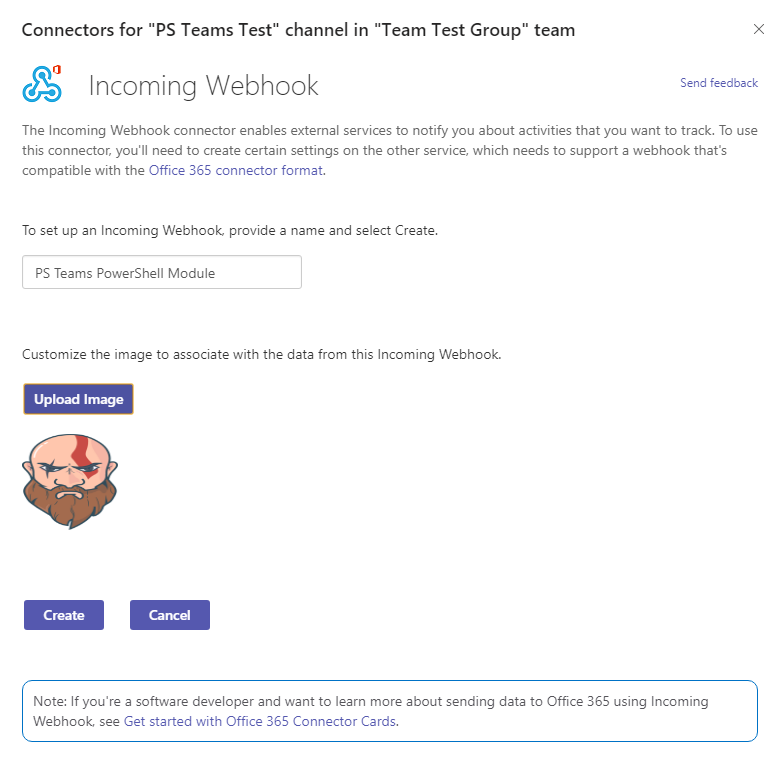 In it's newest form it's cross-platform so you're able to send notifications from your PowerShell Scripts/Modules on Windows / Linux or MacOs. 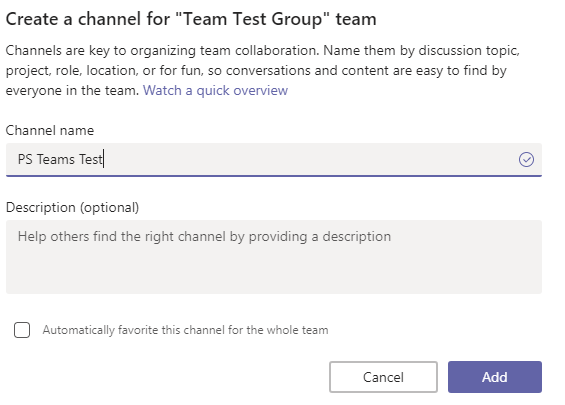 Below is one of big example that covers lots of options showing current possibilities of this PSTeams module. 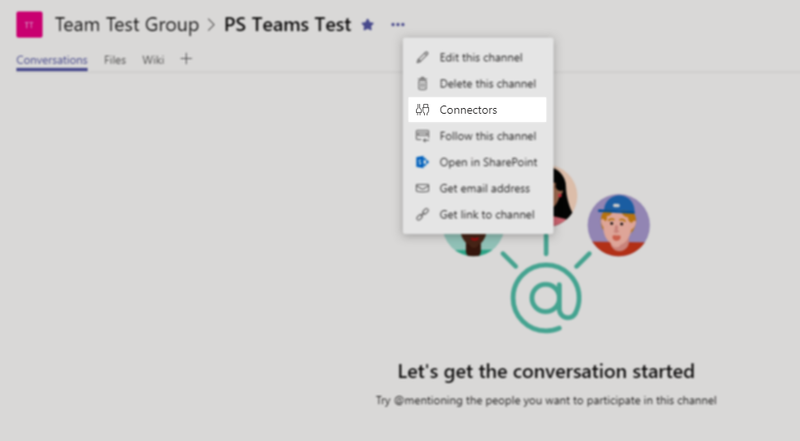 $Button2 = New-TeamsButton -Name 'Visit Polish Evotec Website' -Link "https://evotec.pl"
$Fact4 = New-TeamsFact -Name 'Link example' -Value "[Microsoft](https://www.microsoft.com)"
$Fact5 = New-TeamsFact -Name 'Other link example' -Value "[Evotec](https://evotec.xyz) and some **bold** text"
$Fact6 = New-TeamsFact -Name 'This is how list looks like' -Value "
$Fact7 = New-TeamsFact -Name 'This is strike through example' -Value "<strike> This is strike-through </strike>"
$Fact8 = New-TeamsFact -Name 'List example with nested list' -Value "
$Fact9 = New-TeamsFact -Name 'List example with a twist' -Value "
$Fact10 = New-TeamsFact -Name 'Code highlight' -Value "This is ``showing code highlight`` "
$Fact11 = New-TeamsFact -Name '' -Value "
This is going to add horizontal line below. While this line is highlighed. And multiple facts (to use with ActivityDetails). As you can see above you can use simple markdown to format your Teams Cards. Press 3 dots and open up Connectors. 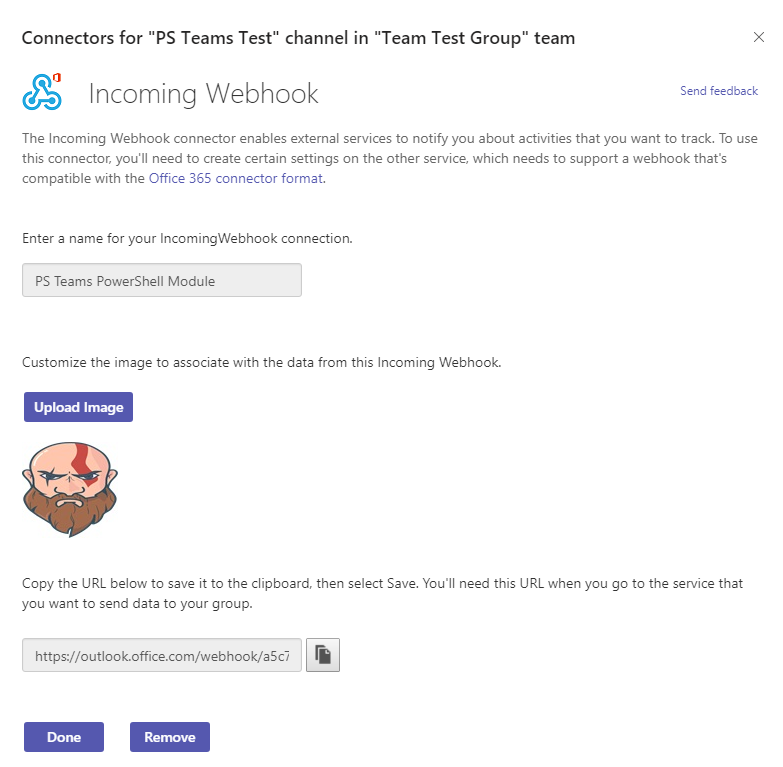 Name your Incoming Webhook, upload an image you want webhook to use. Finally when you create connector all you have to do now is copy the URI from connector to use in scripts. In my example this is called TeamsID. Enjoy!